Save your usual dining places for another time. (SPOT.ph) Whether it’s a 24-hour layover or a five-day-long holiday, Hong Kong is one of those fuss-free destinations you can always visit without worrying much about having an itinerary nor demanding visa requirements. The island has almost everything you need for a perfect weekend getaway in another city, but planning where to eat can become a bit tricky. With its overwhelming gastronomic choices, it’s only natural to gravitate towards tourist-friendly and tried-and-tested eateries like Mak’s Noodles, Luk Yu Tea House, and Michelin-starred restaurants Kam’s Roast Goose (which just opened a Manila outpost) and Yat Lok. 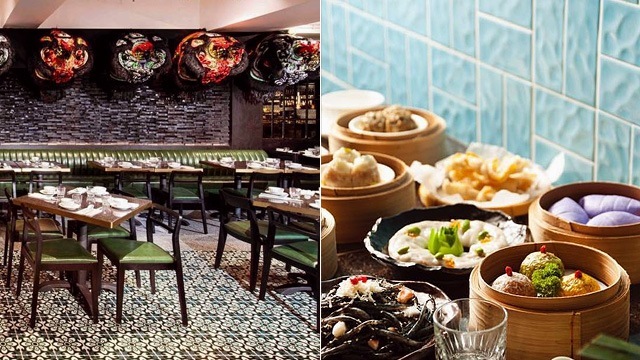 We’ve rounded up new places for you to try, so save your usual Hong Kong dining places for another time and add these delicious spots to your checklist. Steep, hilly roads sprinkled with multi-hued street art often characterize most of Hong Kong’s Central and Western districts. Queen’s Road in Central is a gateway to many of the island’s colorful uphill alleys (including the historic stone-paved Pottinger Street), besides also being known for its vibrant restaurant scene that can overwhelm just about anyone. If you find yourself wandering here, kick off your gastronomic journey at The Envoy, a beautiful restaurant and bar inspired by the island’s century-long British colonial rule. Situated within a boutique hotel, it gives off a low-key appeal, thanks to its almost-secret location. Dining here is a worthwhile experience, with a thrilling view of the city and an extensive menu that brings together Western and Eastern flavors. They serve up British classics like Bangers & Mash, with pan-seared sausages and perhaps the creamiest mashed potatoes you’ll ever have. 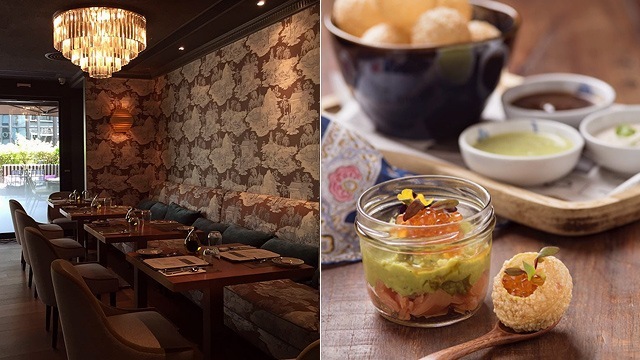 Try some modern Indian street food like the crowd-favorite DIY Pani Puri, with crispy puffed balls, smoked salmon, and green chili chutney, which you have to assemble yourself. Their unique cocktails handcrafted by expert mixologists also landed them a spot in Asia’s 50 Best Bars in 2016, so don’t leave without ordering a glass! The Envoy is at 3/F The Pottinger Hong Kong, 74 Queen’s Road Central, Central, Hong Kong. Main entrance is at 21 Stanley Street. From the same makers of global sushi chain Genki Sushi comes sen-ryo, known by many as the former’s older and more refined sister. The restaurant flaunts traditional Japanese interiors with a modern-sleek flair as opposed to Genki Sushi’s bright and young design. Like Genki Sushi, sen-ryo serves kaitenzushi, or sushi delivered to your table through a conveyor belt. 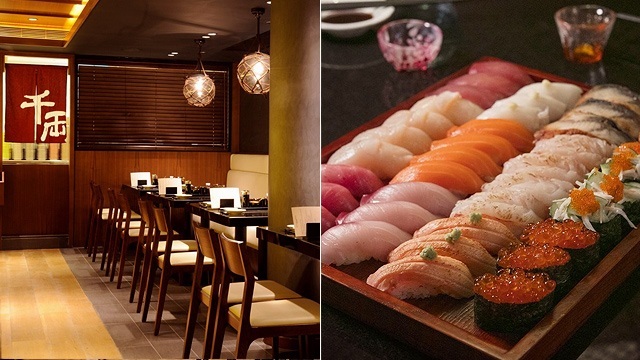 One glaring difference, though, is sen-ryo combines Genki Sushi’s fast-service approach with edo-mae, or the Japanese art of carefully hand-made sushi, so expect fresh and high-quality seafood here. Their tsukiji menu is practically a bible of sushi, offering a wide variety of fish flown all the way from Tsukiji Market in Tokyo. If you’re traveling on a budget, don’t worry because they also have special lunch sets that won’t burn a gaping hole in your wallet. 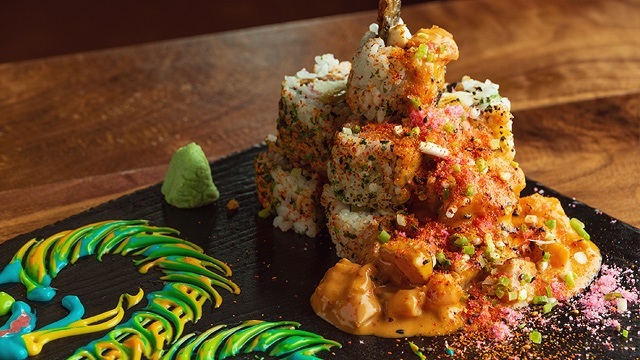 For roll lovers, the Soft Shell Crab and Avocado Maki will make you want to devour the whole platter for yourself (not that we have a problem with that)—made with golden deep-fried soft-shell crab, fluffy sushi rice, freshly sliced avocado, and black tobiko, this is one dish you won’t easily get over. See a list of sen-ryo branches in Hong Kong. What’s a trip to Hong Kong without having good ol’ dim sum? 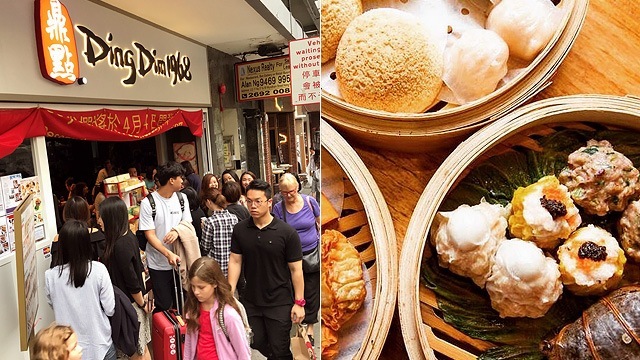 Choosing a restaurant is a complete struggle since the city is packed with amazing hole-in-the-wall eateries, but here’s one to start off your dim sum hunt on the right foot: Ding Dim 1968. This no-frills diner began as a mom-and-pop joint before moving to a bigger and brighter space along Wyndham Street in Central, but it’s kept its old-school charm that regulars seem to love. An all-time favorite is their Baked BBQ Pork Bun, served warm and fresh from the oven, with a flaky and buttery exterior to match its sweet and saucy pork filling. We suggest you come here on off-peak hours to avoid the snaking long line! Ding Dim 1968 is at 59 Wyndham Street, Central, Hong Kong. 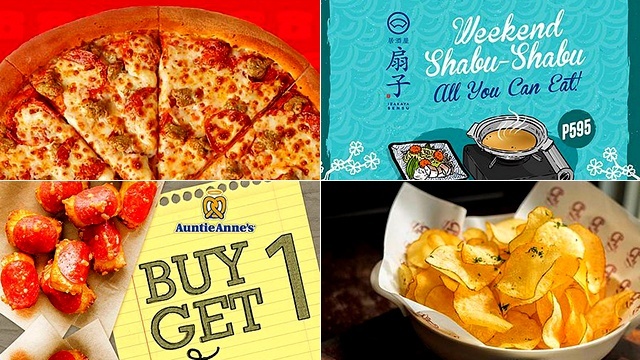 Whether you just want snack-sized bites or a belly-bursting meal, Waahlah has something to suit your every craving. The hip restaurant-slash-café is perfect if you want to relax after a long day of shopping or sightseeing, with an extensive menu composed of Asian-themed dishes ranging from Vietnamese Spring Rolls to Singaporean Laksa. Meanwhile, their modern takes on classic meals deserve all the praise, too. The “Bo-LAH-Nese” Linguine, for one, isn’t the usual meaty Bolognese your mom whips up at home—Waahlah’s version gives it a funky twist with pork-and-sausage ragout, ipoh soy sauce, and a gooey sunny-side-up egg. Hungry yet? Waahlah has branches at 12 Pak Sha Road, Causeway Bay; and G/F POPWALK, 12 Tong Chun Street, Tseung Kwan O, Hong Kong. Dragon Noodles Academy, otherwise known as DNA, isn’t your typical Cantonese street-side eatery. The restaurant is your best bet if you feel like treating yourself to some lobsters, executed in fun new ways. You’ll surely rave about the Crispy Lobster Puff once you get a taste of it—think buttery puff pastry wrapped around juicy lobster meat, fresh coriander, and crunchy chopped water chestnuts. If you want something more filling to get you through the day (we know you still have a lot of IG-worthy places in HK to see), grab a steaming hot bowl of Lobster and Shrimp Roe Lo Mein, an umami-rich noodle soup that’s slow-cooked with lobster, diced vegetables, and a dash of brandy for that extra oomph. Dragon Noodles Academy is at G/F Man Yee Arcade, Man Yee Building, 68 Des Voeux Road, Central, Hong Kong. We admit: An Italian restaurant isn’t the first place you’d think of when scouring for good eats in Hong Kong. Opened in 2017, Pici Pasta Bar is a little neighborhood joint that’s known for their homey pasta dishes. Brick walls and communal tables add to the coziness of the restaurant, while bar seats are also available for solo diners. 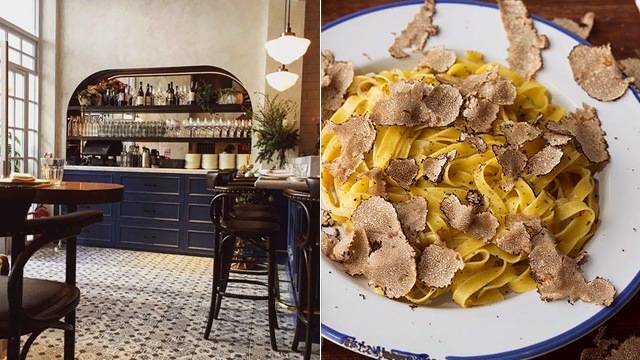 If you want to be indulgent, you can ask them to whip up a plate of their signature Tagliolini With Shallot White Truffle Paste and Fresh-Shaved Black Truffle. What makes this dish so eye-catching is the generous shaved discs of black truffle on top of al-dente homemade pasta. Cheese fanatics will also love the restaurant’s homemade burrata, which is plopped on a pretty bed of baby rocket, cherry tomatoes, and a pool of olive oil. Pici Pasta Bar is at 16 St. Francis Yard, Wan Chai, Hong Kong. Hong Kong has some of the best hidden bars in the world, and one of them is Dr. Fern’s Gin Parlour. Located on the basement floor of a mall that’s connected to a subway station, finding this gin bar can be quite a challenge, especially if it’s your first time looking for it. (Hint: Look for two black doors with a sign that reads, “Waiting Room. By Appointment Only.”) Not a lot of people know that this pharmacy-themed bar, with over 250 gins to choose from, also has worthwhile munchies to stuff a grumbling tummy, pre-drinks. Catch their quirky afternoon tea set from 2 p.m. to 5 p.m. where you can relive Alice in Wonderland’s Mad Hatter Party with smoked salmon toasts, matcha tarts, and even lobster rolls paired with either coffee or tea. But if you want to start the fun a wee bit early, you can always upgrade your caffeine to a glass of Gin & Tonic—no one’s going to judge. Dr. Fern’s Gin Parlour is at Shop B31A, Landmark Atrium, 15 Queen’s Road, Central, Hong Kong. 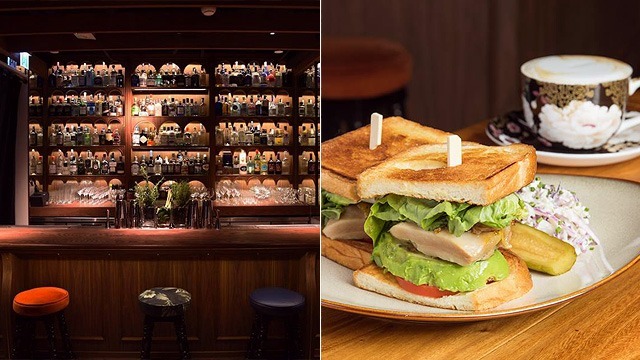 Samsen is a hidden gem in Hong Kong’s bustling Wan Chai district. 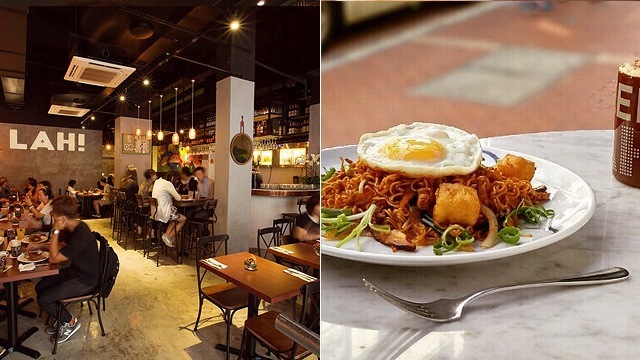 Since it opened its doors in 2016, the restaurant has been offering no-fail Thai street food to foreigners and island locals alike. Their signature rustic and homey appeal is seen through the joint’s al-fresco and vintage wood-covered space, which will remind you of old shop houses all over South East Asia. From the outside, it’s hard not to notice the aroma of their addictive noodle dishes wafting in the air, marked by special Thai herbs like coriander and lemongrass. There are a lot of noodle-centric meals to try out here, but perhaps the most exciting is their Wagyu Beef Boat Noodles. Besides melt-in-your-mouth morsels of Wagyu beef, the deep bowl of thick brown, soy sauce-based soup is made with chewy noodles and secret herbs and spices. Finish your meal with Young Coconut Ice Cream for some cool refreshment. Samsen is at 68 Stone Nullah Lane, Wan Chai, Hong Kong. Tracking down this restaurant along Staunton Street is easy—just look for a shop with bright seafoam-green panels and a giant neon-lit logo of a baby. It’s almost an understatement to call Little Bao a standout. Their playful take on steamed buns or bao have the power to grab your attention, especially if you’re hungry. With a two-page menu offering only small bites, baos, a few desserts, and cocktails, you’re bound to find something that’ll please your taste buds. Their best-selling Pork Belly bao isn’t only a feast for the eyes, but also for the tummy, with two pillow-soft buns sandwiching a thick slice of slow-braised pork belly, leeks and shisho red onion salad, and dollops of sesame dressing and hoisin ketchup. For the sweet tooth, the LB Ice Cream Bao features the same buns, but it’s paired with their homemade matcha ice cream with condensed milk. 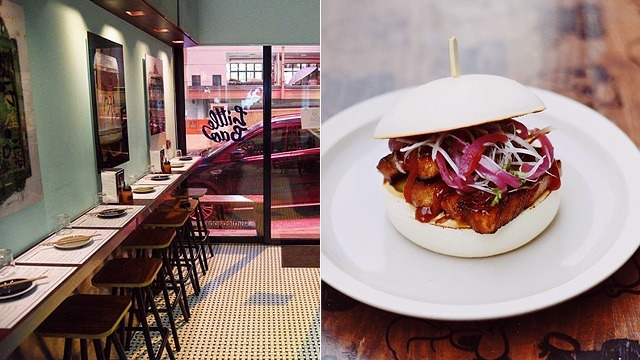 Little Bao is at 66 Staunton Street, Central, Hong Kong. 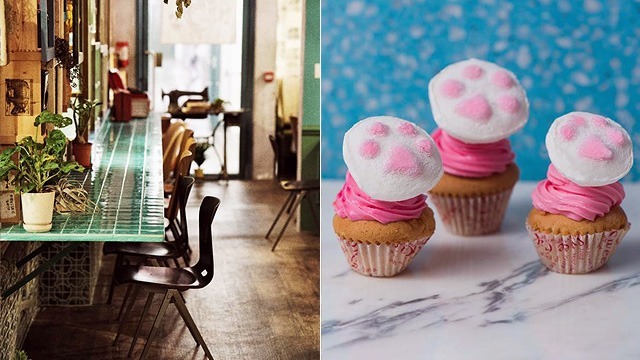 You might confuse Garden Meow Café with a pet café, even though it might make sense since it’s found at Hong Kong’s hippest lifestyle building, PMQ. 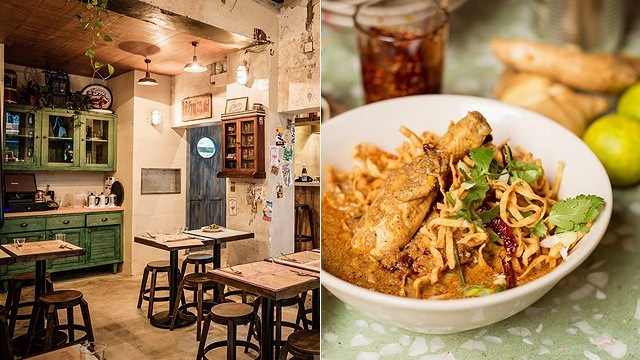 The cool Taiwanese restaurant is filled with charming vintage finds and furniture, and perhaps what could justify this as a pet café are the quirky images of cats sprinkled throughout the joint. Meanwhile, their food and drinks are as colorful as they can get; a great example are their cold beverages. The Walk Over The Cloud, a photogenic blue soda and cream drink with cotton candy on top, can perk up anyone’s day. If you get hungry from exploring all of PMQ’s six floors, go ahead and order the restaurant’s bento boxes, which includes rice or noodles, a protein of your choice, and refreshing sides. We recommend you try the Taiwanese-Style Drunken Chicken with Cold Noodles—it’s best matched with their Brown Sugar Milk Tea, too! Garden Meow Café is at G/F PMQ, Aberdeen Street, Central, Hong Kong.